In a just-released survey conducted in late 2013, of 1,080 television network, print and online journalists, 28 percent self-identified as Democrats and only one-fourth as many, a piddling seven percent, called themselves Republican. That four-to-one disparity is up from two-to-one (36 to 18 percent) in the same poll taken in 2002, as the share of Republicans has plunged by 11 points. 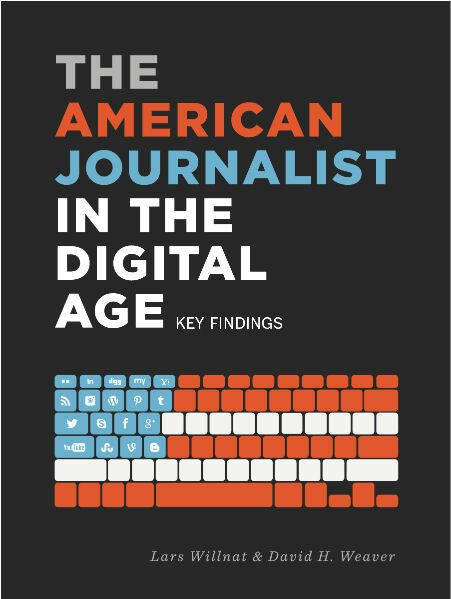 The numbers come from “The American Journalist in the Digital Age,” the latest in a decennial poll of journalists conducted, since the early 1970s, by the School of Journalism at Indiana University. Compared with 2002, the percentage of full-time U.S. journalists who claim to be Democrats has dropped 8 percentage points in 2013 to about 28 percent, moving this figure closer to the overall population percentage of 30 percent, according to a December 12-15, 2013, ABC News/Washington Post national poll of 1,005 adults. 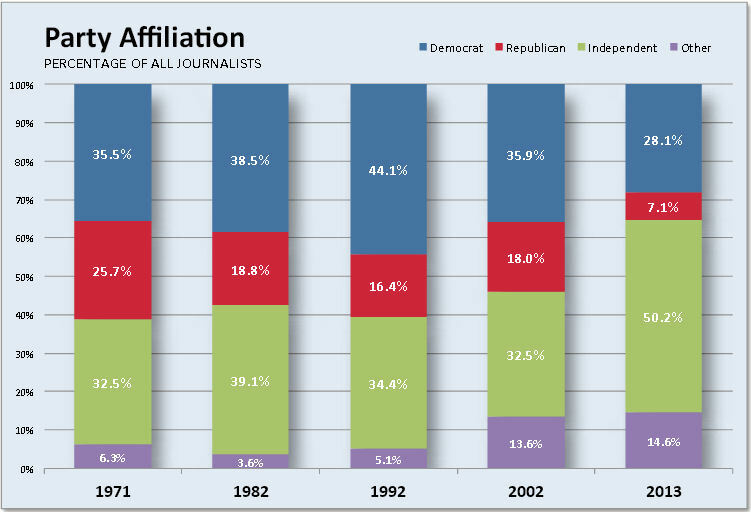 This is the lowest percentage of journalists saying they are Democrats since 1971. An even larger drop was observed among journalists who said they were Republicans in 2013 (7.1 percent) than in 2002 (18 percent), but the 2013 figure is still notably lower than the percentage of U.S. adults who identified with the Republican Party (24 percent according to the poll mentioned above). About half of all journalists (50.2 percent) said they were independents, which is 10 percentage points above the figure for all U.S. adults (40 percent). Overall, U.S. journalists today are much more likely to identify themselves as independents rather than Democrats or Republicans — a pattern not observed before 2002. The MRC’s “Media Bias 101,” compiled by the MRC’s Rich Noyes, with a dozen past polls revealing the political views and voting habits of those in the news media. It includes summaries of the 1982 and 1992 Indiana University polls.